What is a Michigan Month to Month Lease Agreement? Michigan Month to Month Lease Agreement: What Is It? 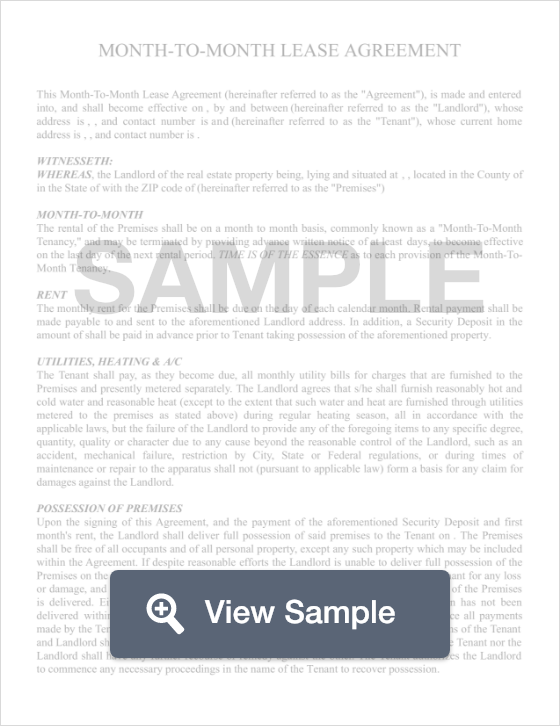 In Michigan, a month to month lease agreement is a document that landlords use to rent out a property on a monthly basis. Contrasting from a traditional one year lease, a month to month lease is only valid for 30 days, and renews automatically at the beginning of each month. Just like a long term lease agreement, a month to month lease will specify the terms of occupancy such as the amount of rent due, the date the rent is due, and other terms such as late fees, parking, and rules of occupancy. Once either party is ready to terminate the lease, he or she must give a written notice at least 30 days before the effective date. According to Michigan Law, anyone who wishes to terminate a month to month lease agreement must give at least one month’s (30 days) notice. However, if the landlord may terminate the lease with seven (7) day’s notice if the tenant refuses to pay rent.